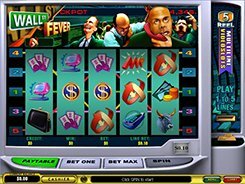 A classic-style Triple Profits slot has three reels and three paylines. 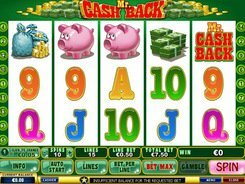 You can wager up to five coins per line with an adjustable denomination between $0.01 and $5. The top bet per spin climbs up to $75. 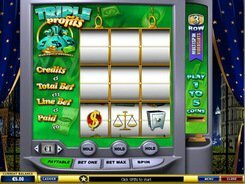 Symbols in the Triple Profits video slot feature dollar signs, money bags, calculators and other finance-themed icons. 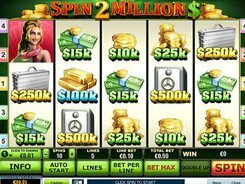 A wild is represented by the Gold Bars symbol which is the highest-paying icon in the slot, with those three granting 1000 coins at the maximum bet. In addition, a wild can be transformed into other regular symbols to complete combos. The Stack of Money symbol is a scatter symbol. 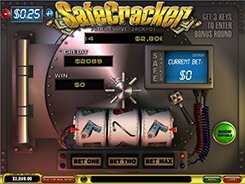 Three scatters landed anywhere on the reels trigger the Moneybag Bonus feature where you have to select bags. If you have placed the maximum bet, you can choose three money bags out of twelve. All the bonus game symbols contain random cash prizes. PLAY FOR REAL MONEY!